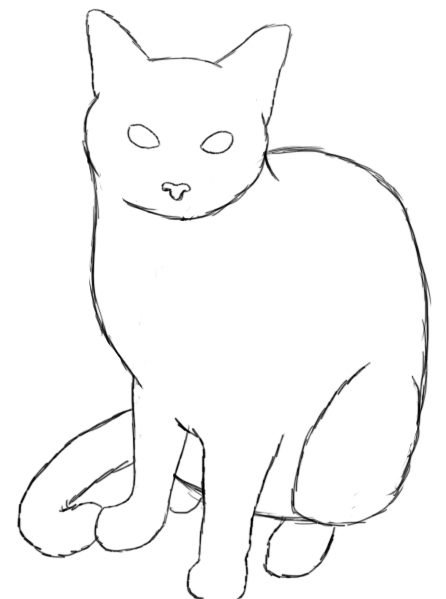 Today we are going to learn how to draw a cat. This is a tutorial that has been requested several times, which I have put off for quite a while. 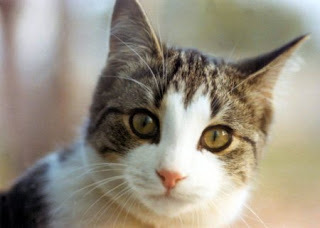 It has been estimated that there are over 80 million pet cats in households in the U.S. today. With that number growing every day, it makes sense that we would see cats in artwork too. 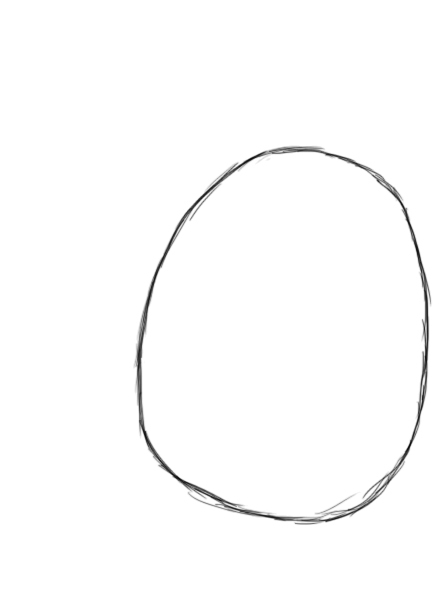 As with most of my tutorials, the first step is to draw a simple oval which will become the body of our cat. In this pose, our cat is going to be sitting down, so the oval needs to be more tall than wide. 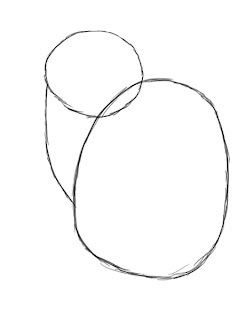 To the top-left of the first oval you drew, draw a small circle for the cat’s head. 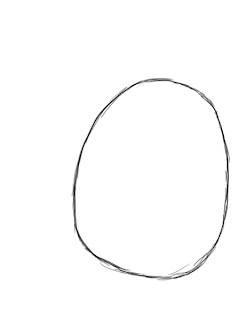 This circle should be about 1/4 the size of its body. The circle of the cat’s head should also overlap just a small bit inside the oval of its body. 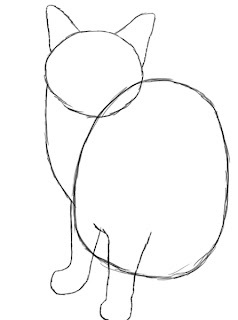 Draw another line that extends from the circle, down to the near bottom of the cat’s body. This will be its neck. 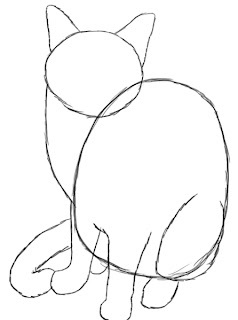 On top of the cat’s head, draw a couple angular ears. If you have ever noticed, most cat breeds have ears that are almost perfectly triangular. 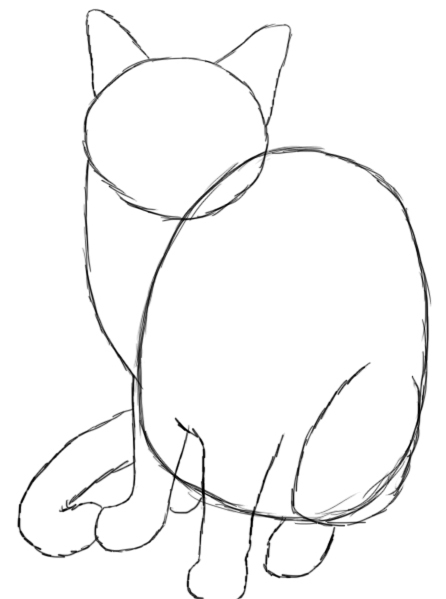 Where the cat’s neck meets it’s body, draw in a couple short front legs. As you can see in the image on the right, the cat’s legs are very simple shapes– almost like a candy cane. Next, give your cat a tail that pokes out from behind its body. Depending on the breed of cat, its tail can be very skinny, or bushy. For this tabby cat, I opted for a slim tail. 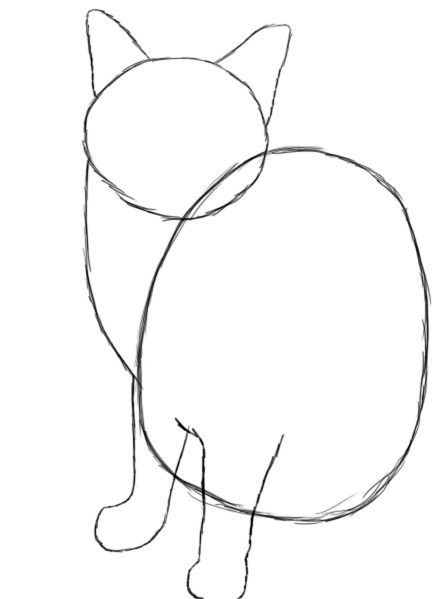 On the right side of the oval of the cat’s body, draw in another small oval which will be the cat’s bent rear leg. Poking out from that oval, draw another small circle for it’s rear paw. 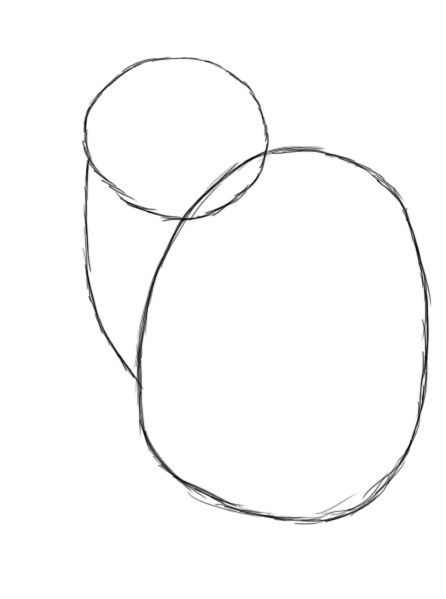 Next, erase all the overlapping guidelines from the previous steps. Once you have a solid figure, you should be starting to see your cat take shape. Give your cat two large, almond-shaped eyes directly in the middle of its head. 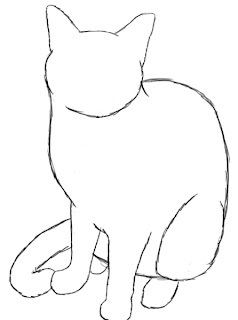 Draw the nose of your cat near the bottom of its head. A cat’s nose can be a tricky thing to draw, but it helps to keep in mind that it is shaped almost like a “T”. At this point, your cat is pretty much finished. 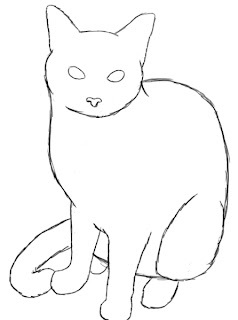 The last step is to draw in the last details to really bring your cat to life. 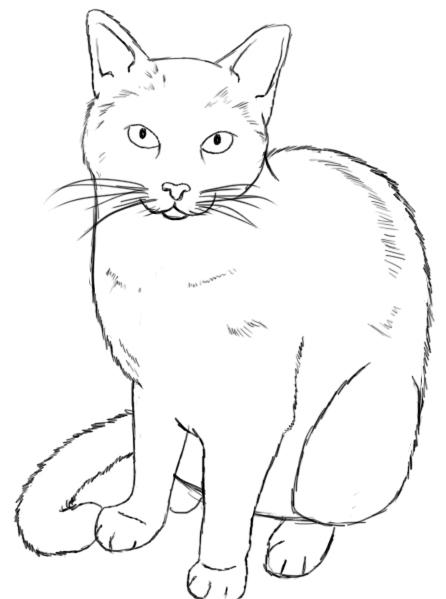 Give your cat a few whiskers, and some quick, whispy lines to suggest fur. 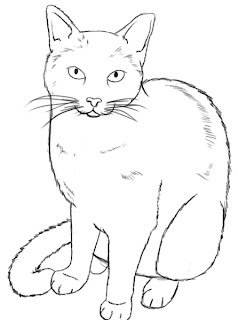 Draw in three to four short vertical lines on each of the cat’s paws for its toes. And there you have it! You’ve just drawn a cat! I hope you’ve enjoyed another tutorial. Thanks, and remember to comment and share this tutorial on Facebook and Twitter!